I do not approve of what Doctor George Tiller did for a living. But I do not believe he deserved to be murdered for it. The way to stop abortion is through education, not legislation, intimidation, and terror. This is an act of terrorism, and I hope the killer is convicted under the most dire of those laws. The coward deserves to rot in Gitmo for his action. If the murderer had the courage of his convictions he would have worked to end abortion through legal means. Update and Note: Tiller performed late-term abortions on fetuses that were either not viable or barely viable. His services helped women like the one in this story, who desperately wanted children but had a complication that forced them to choose between having a child who might die soon after birth anyway, or if the child lived, might be mentally and physically disabled so severely that "life" would be miserable and short. While I still do not condone abortion, the acts of this doctor are in that grey area of my moral compass, where I only pray I never have to deal with myself. I take back the first sentence of this post. The court upholds the ban. And, as much as I disagree with Prop 8, I think the court made the best possible ruling at this time. They upheld the thing while allowing marriages that had already taken place to stand. If the courts had overturned it, then idiot Republicans would have whined about "legislating from the bench!" and made a fuss over their efforts to force their own morality on everyone being taken out by the privileged few. Now the folks in California need to get busy overturning Prop 8 legally. Since Prop 8 was promoted via falsehoods and fear, they need to educate the public on how the Prop 8 supporters scammed them with outright lies. The obscene insult to freedom that is Prop 8 needs to be overturned by the people of California. And this time, they should not let a well-funded campaign of lies fool them into legislating morality. 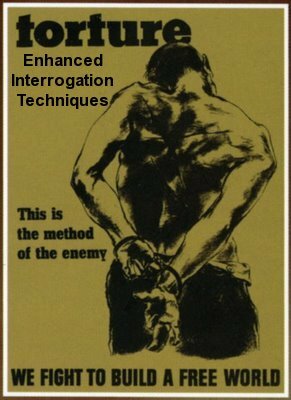 Torture is not an effective method to get reliable information. What does work? The Bush Administration's crimes of torture have damaged this nation more than any terrorist attack, and have led to the deaths of more Americans than were murdered on 9/11. Favoring the use of torture is not a political position, it's a mental illness. Christians: In Charge and yet Persecuted?